If you are in a room without proper window treatments it can be a bit unnerving. Windows without some sort of covering can allow anyone to see into your home posing a possible security risk for you and your loved ones. Typical blinds are easily broken and often need replacing. Curtains allow gaps where they meet and are either closed or open with no option in between. Shutters however are an excellent solution. They are a handsome window treatment that adds value to your home. They can offer total privacy or when opened let in as much light and view as desired. Here are some tips when considering wood shutters and how to get the most out of them. Rooms that require privacy do best with full height shutters like those above. For rooms that need a little less privacy, cafe shutters can work well. They cover the lower portion of the window up to desired point and then the top space is left open to allow natural light in. If you have questions about which shutters would work the best in your interior please give Newport Custom Shutters a call or you can send us a message using the contact page right here on our website. We look forward to hearing from you. Historic and architecturally detailed home needs new exterior shutters. That was the Designer/builder’s brief. We met the builder and owner on site and discussed the design details of the shutters. The shutters are made in our woodshop right here in Redmond. We custom matched the paint finish that was desired and here is the end result. Fabulous. 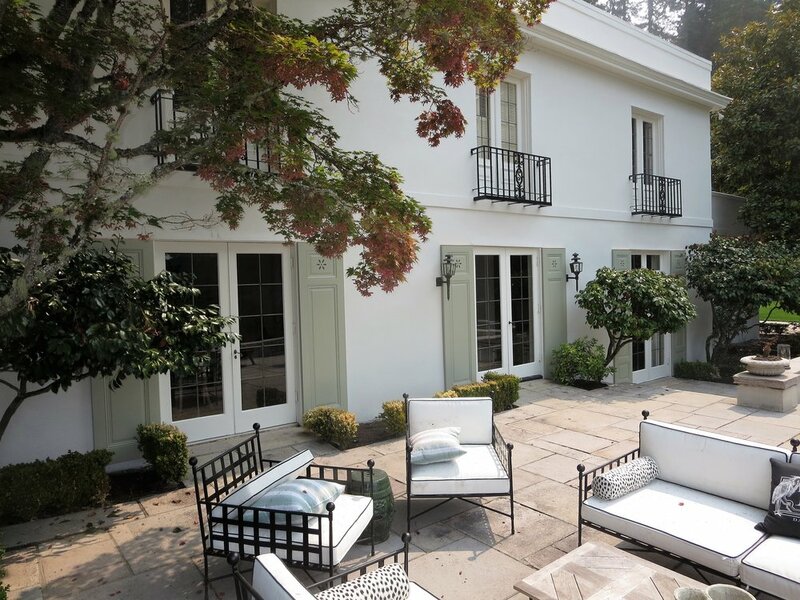 If you would like to discuss exterior shutters for your home we would be glad to hear from you. Shutters are unique in that they are insulating, light infusing, and add real value to your home. If you wish to achieve privacy you can simply close them, if you want to flood the room with light white wooden shutters actually brighten a room and reflect light in a beautiful way. Wood shutters are versatile and work with practically every type of interior. They are timeless treasures that maintain their appearance and value over time. When properly cared for shutters can last for as long as you own your residence. Call or email Newport Custom Shutters for more information. Expertly crafted wooden items tend to last a long time. Due to exceptional construction methods of our wood shutters, they are likely to outlast the homeowner. Comparatively, plastic or faux wood shutters do not have the same longevity of wood shutters. Many times composite faux wood shutters will bow, bend, or break within a few short months, especially if the shutters are installed in an area of direct sun. In addition homes which have real hardwood shutters will appraise for more than houses that do not. Wood shutters are easy to clean and maintain. The air in your home will be less subject to air toxins and unwanted debris because the shutters are simple to clean due to their structure and resilient paint finish. Conversely blinds or curtains can trap debris and dust which can only be removed by dry-cleaning or ultrasonic cleaning by a professional. Lastly, shutters help to control the temperature of your indoor space due to their exceptional insulating properties. This is especially helpful in summer and winter months. Here is an example where a custom room partition was designed for a local commercial building. 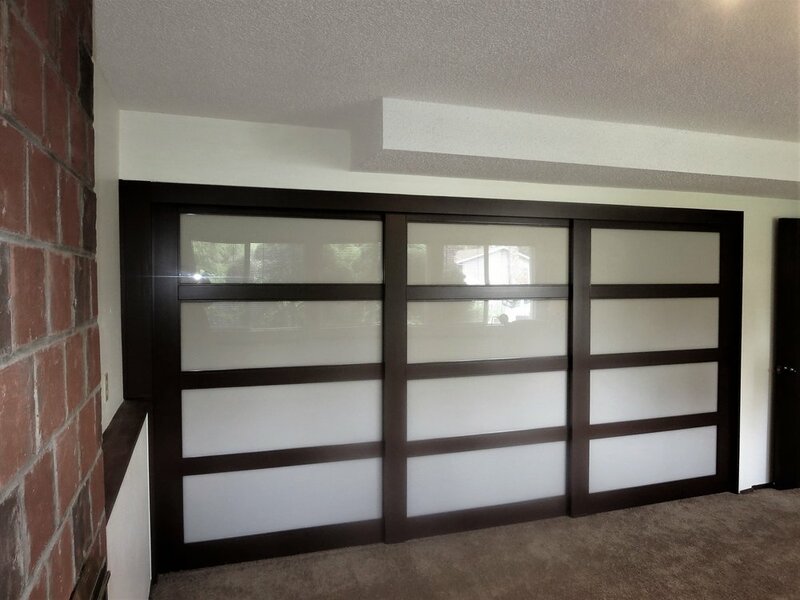 We assisted the client with design, color and glass choice for these sliding doors.